Description: Interview with two Women's Health Center representatives explaining choices and implications of using birth control. Discussion of birth control experimentation on women without consent, women's health movement, and contraceptive options. Followed by b-roll of Giger and interviewees discussing past fertility medicine and Western perception of pregnancy. Discussion of legislation around midwives. Interviewees talking about sterilization, cesarean sections, induced labor. Visuals of contraceptives— diaphragm, IUDs, foam, package of birth control pills. Giger and interviewees discuss women's health in background. 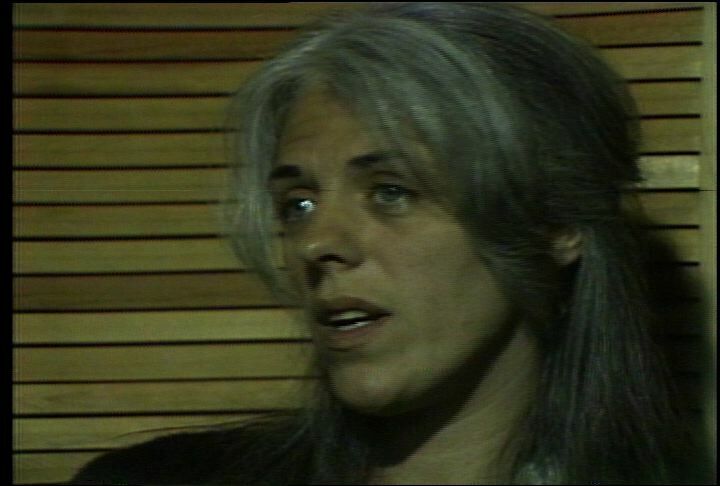 Clip of books "Our Bodies, Ourselves" and "Contraceptive Technology 1976-1977." Poster "Freedom for Women" on wall. 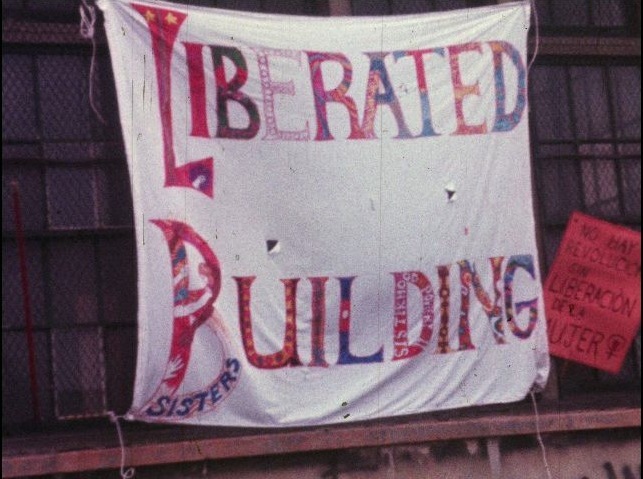 Description: Exteriors of the Harvard building (888 Memorial Drive) taken over by members of the Women's Liberation Movement. Banners hanging off the front of the building that read, "Boston Women's Center" and "Liberated Building." There is also feminist graffiti and signs. Women entering and exiting the building. 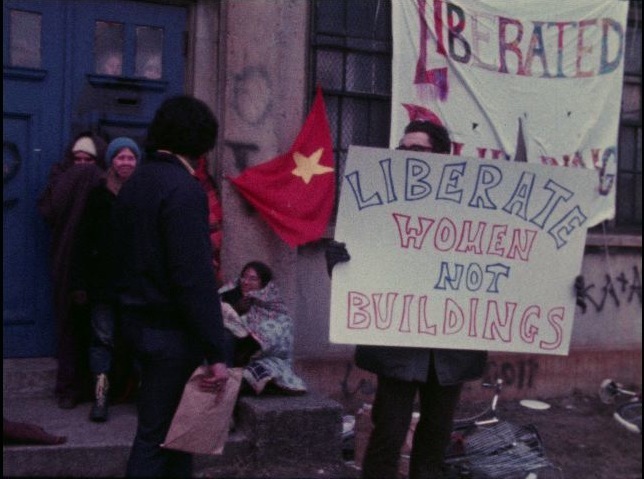 Description: Women's Liberation Movement takes over Harvard building (888 Memorial Drive), renaming it the "Women's Center." Exteriors of the building, with banners hanging on it. 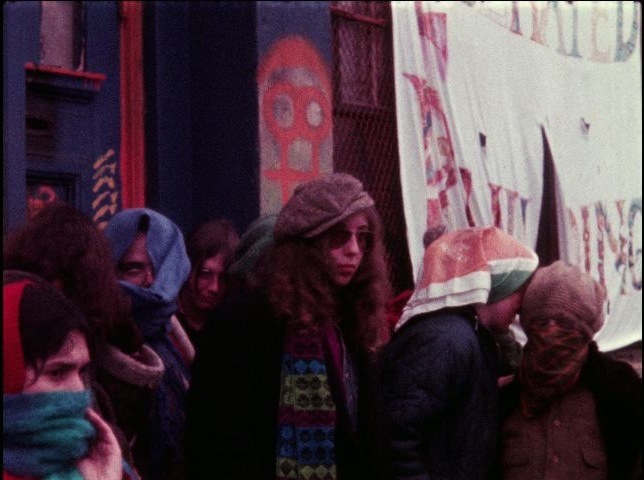 Crowd of children in front of the building. Interiors of the building, with women singing. A woman makes a statement about the women's programs set up and the lack of facilities for them. Crowd of people are gathered of Harvard Square and march through the streets towards the Women's Center. The crowd yells war cries. Harvard University police car outside the building, making an announcement over the megaphone that bans congregations of students that disrupt normal campus activities. Women in the building look down through second floor windows. Reporter standup on the public reaction to these events. Description: Harvard building (888 Memorial Drive) takeover. Exteriors of building with feminist graffiti on walls. Men outside of the building. Women entered building. 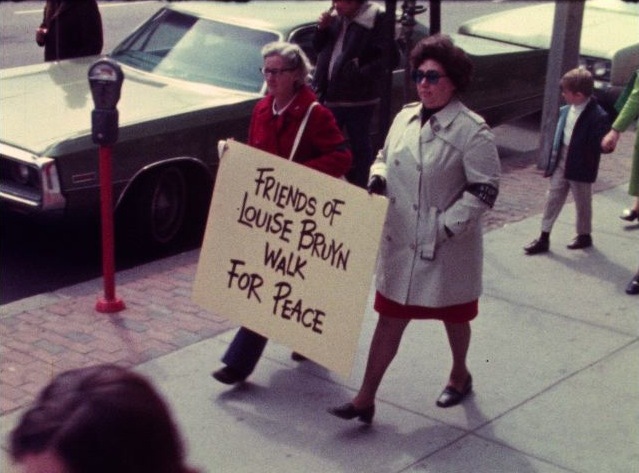 Description: Compilation of footage on multiple women's rights protests. Women bundled up sitting outside the Harvard building (888 Memorial Drive) they took over and renamed the "Boston Women's Center." A group of young men walk to the building with signs reading "Liberate Women Not Buildings. A man speaks as a representative of the Harvard Republican Club for Equality and Economic, Political, and Social Opportunities for Women, and he criticizes the women's methods of protest because they include breaking the law. The women make noise over his speech, and some of the women shout responses. The men picket in front on the building. Further exchanges between the two groups. 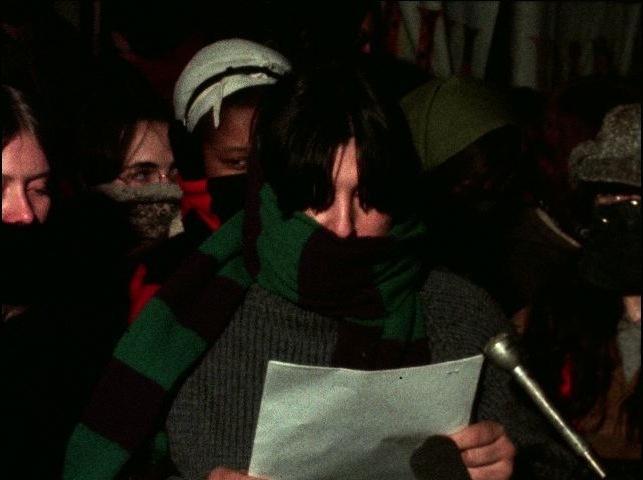 Women hold a press conference three days after the takeover where they discuss their demands and the support of the women in the community. Another press conference on March 14, a week after the takeover. Women move out of the building. They hang a new banner on the outside of the building. People gather to watch the women moving out. Harvard police patrol the outside of the building and break open the front door. Interview with a man in the crowd. Press conference held by Boston College students on their petition demanding Ann Flynn be reinstated as Dean of Women and the sit in of Boston College students in administration offices. Another young man at the press conference also addresses the issue of military recruiting on college campuses. They discuss the involvement of Father Seavey Joyce, President of Boston College. 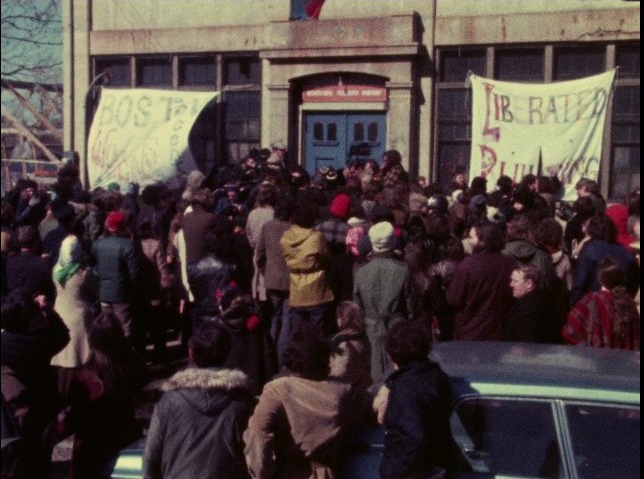 Students gathered at a rally. Description: Profile of cellist Yo-Yo Ma. Interview with Ma on his childhood playing. Ma plays a piece in his Cambridge living room. Ma talks about being a cello soloist and the small amount of music written for the cello. Interview with Benjamin Zander on working with Ma. Ma rehearses Brahms Trio and jokes around with violinist Lynn Chang and pianist Richard Kogan. Ma talks about his technique. Ma, Chang and Kogan play at a benefit for Cambodian refugees at Sanders Theater. Christopher Lydon introduces and ends report. 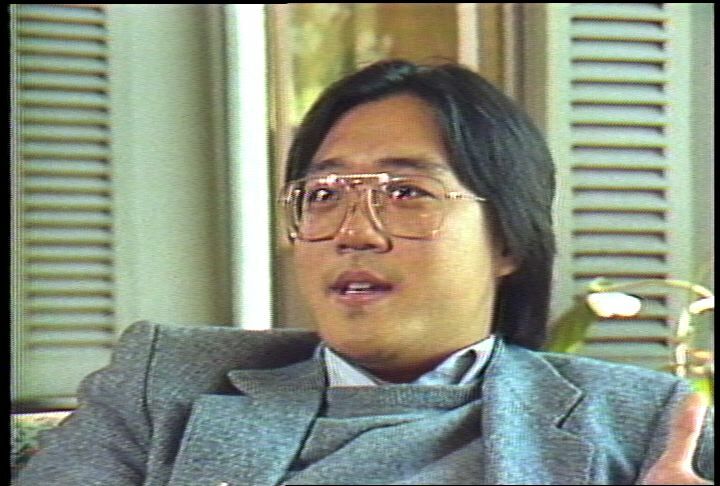 He notes that Yo-Yo Ma is having surgery on his spine.